An MBA, three nurses and a doctor at UMass Medical School’s Center for Health Policy and Research (CHPR) – Office of Health Care Innovation and Quality are back again. In the evaluation world, we often use QI methods to improve the processes by which we conduct our work, such as improving systems for file management, which we discuss below. Sometimes, in pursuit of improvement, we skip over the causes and try to fix the symptoms. While this may initially work, it often results in less than a permanent solution. Before you jump to “fixing” the problem, STOP! and consider using a Fishbone Diagram, also known as a Cause and Effect Diagram, to identify the root causes. The fishbone framework categorizes the symptoms and allows for a deeper causal analysis. Here are a few suggestions for getting started, using the “Inefficient Project Files and Documents Management on our Shared Network Drive” diagram below as an example, which is a problem being addressed within a CHPR unit. Form a brainstorming team. Include a facilitator, subject matter experts, and “devil’s advocates” (to ask specific, useful questions). Draft a clear problem statement. Be specific about how and when the problem occurs and the problem’s impact. Define your fishbone categories where the real cause may be hiding, including: Manpower, Methods, Materials, Measurements, Mother Nature, and Machines. Select categories that apply to your problem asking: Why does this happen?. Eliminate causes that don’t apply or make a list for future consideration. Identify root causes and determine which ones warrant further investigation and resolution. Develop an implementation plan; assign responsibilities and include timelines. Don’t rush through the brainstorming session or drag it out unnecessarily. It’s okay to put a cause in more than one category. Include sub-causes when applicable. Asking “Why” multiple times about each cause may generate layers of branches which indicate causal relationships (known as the 5 Why’s in LEAN). Team participation: The ideal team size is six to twelve members. The facilitator creates a safe environment so members can speak freely and ensures every member is heard. Visual representation: Seeing the fishbone diagram stimulates thinking and explores possible solutions. Cause and effect identification: Involving the right people helps to quickly and effectively identify multiple root causes, facilitating quick and effective problem resolution. Data collection: The fishbone framework keeps the team focused on what data need to be gathered in the most efficient and useful way. Finally, take your solution for a test. The first attempt may not be perfect. That’s okay; practice makes perfect. Document the solution, share with all impacted parties, and continuously monitor the progress. 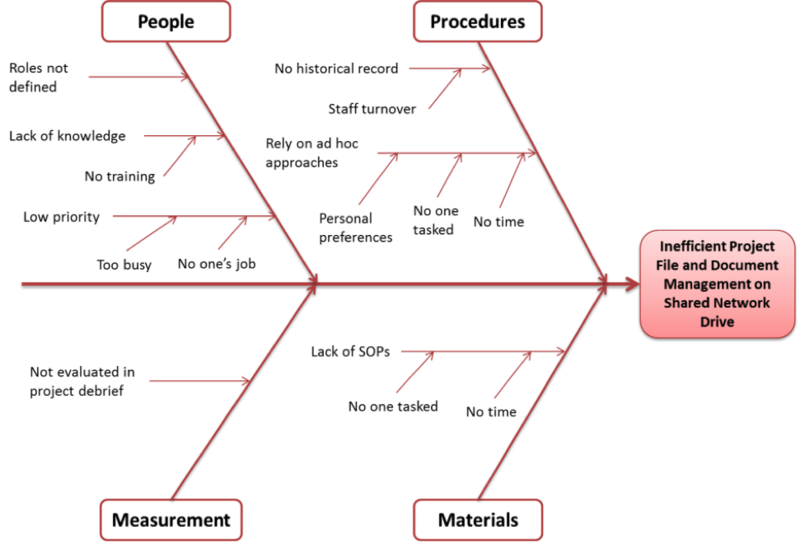 Rad Resource: Use this link to learn more about the Fishbone Diagram and other QI tools. Not only is it an interesting way to generate a theory of change, it is an effective way to get buy in and acceptance. A Fishbone is a great evaluation tool that draws from everyone’s input. You are not off your rocker! This seems to be an interesting way to generate a theory of change…or am I off my rocker?